This section is from the book "Some Wild Flowers Of Tasmania", by Leonard Rodway. Also available from Amazon: Some Wild Flowers Of Tasmania. A stranger who knows something of flowers is generally struck with the number of shrubs and herbs in our bush, whose flowers are so irregular that they may be called lopsided. Perhaps the most interesting of these is the herb we call Trigger-plant, also Jack-in-the-box. It is a conspicuous plant with numerous pretty pink flowers arranged on an upright stem. The flowers are very peculiar; the stamens and pistil are united in a bent column; the anthers ripen first; the column is bent back like a trigger; now, if a fly settles at the base of the column, looking for honey, the trigger suddenly springs forward, so as to bring the anthers on to the fly's back. The insect in endeavouring to escape gets its back covered with pollen. The fly next visits an older flower, and here the anthers are shrivelled up, and between them the ripe stigma protrudes. The same spring occurs again, but now the stigma is rubbed on the insect's back which is already covered with pollen, and thus cross-fertilisation is effected. Parrot's-food and its allies are very one-sided, and except in some small white-flowered species, and two which are blue, are always yellow. 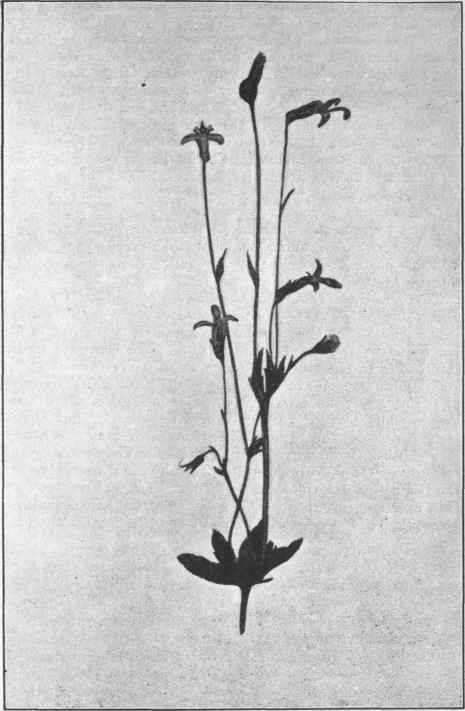 The flowers have no trigger, but crossing is effected in a somewhat similar manner; the anthers mature before the flower opens; the style is in the form of a brush that is a stalk and the brush at the top. This brush is two-lipped, and each lip is furnished with bristles. The stigma, shaped like a cushion, pushes its way out between the lips which bend back, and the bristles prevent the pollen of the same flower from fertilising it. We have many Lobelias which are similarly constructed, except they have not a brush-termination to the style. Eyebright is a pretty perennial, with irregular flowers of varied colours, white, yellow, or blue, which should repay cultivation in our gardens. Veronica is closely allied to Eyebright. They are also called Speedwell. The nearly regular flowers are blue, with a four-lobed corolla, combined in a short tube, and bearing only two stamens. The last of the lop-sides we will note is that pretty shrub commonly called Tasmanian Christmas Bush, likewise Native Lilac or Mint-tree. It really belongs to the Mint family, that is the Labiates. This can always be identified by the fruit consisting of four one-seeded nuts. Of the common plants we may here refer to Heart Berry, though so different in form, is closely related to the English Lime-tree or Linden. Native Olive, for a wonder, is correctly named, for it is a member of the Olive family. The berries are numerous, and semi-transparent, and all colours from white through pink to nearly black. The wood is very dense, and is often known as Ironwood. The Toughbarks, including Cotton Bush, are of interest in that the flowers are white and petal-like, but as there is only one series in the perianth it is a calyx, not a corolla, though it looks very like one. Ant's Delight is a small heath lying flat on the ground; the flowers are numerous, brownish-green, and open beneath so as to be close to the soil. Ants frequent it, and no doubt are the means of fertilising. There is little beauty in the flowers of Sedges, Grasses, and their allies. The former contains very many forms in Tasmania, but they are not particularly attractive, and too harsh to be useful; at the same time they are most interesting to the student who cares to study them. It is very different with grasses. This is the most useful family of plants upon the earth. Not only does grass afford the greater part of food for our domestic animals, but their seeds constitute the principal sustenance of man. Wheat, Rice, Maize. Oats, Barley, Millet, together keep the human race alive. If we cannot go into raptures in contemplating the beauty of grass flowers, we can at least feel respect for this excellent group for the good they do to humanity. It would be a poor world indeed were this family absent.